Glutamine has recently been the focus of much scientific interest. A growing body of evidence suggests that during certain stressful times, the body may require more Glutamine than it can produce. Under these circumstances, Glutamine may be considered a "conditionally essential" amino acid. 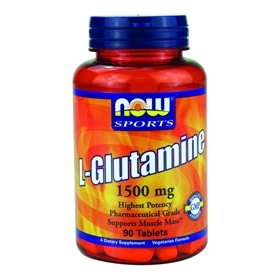 Glutamine is involved in maintaining a positive nitrogen balance (an anabolic state) and also aids rapidly growing cells (immune system lymphocytes and intestinal cell entercocytes). In addition, Glutamine is a regulator of acid-base balance and a nitrogen transporter. Suggested Usage: As a dietary supplement, take 2 tablets 1 to 2 times daily, preferably between meals. Consider taking this product in combination with NOW® B-6 and Whey Protein. Other Ingredients: Cellulose, Stearic Acid (vegetable source), Silica, Magnesium Starate (vegetable source) and Vegetable Coating. This product contains Pharmaceutical Grad (USP) L-Glutamine.